I used some more of the BG Lily Kate paper and I finally tried doing a sewn ribbon ruffle. It took *forever* but I really like how it turned out! The blue scalloped piece was cut with a pair of jumbo scallop scissors and a 1/8" hole punch. The sentiment is also from the You Take the Cake set. TFL! The first step is to stamp out the image on white cardstock and all of the patterned papers I want to use. In this case I've chosen a couple of prints from Basic Grey's Lily Kate line. I try to figure out ahead of time how many different layers I want and stamp as many images as I'll need. But of course, I can always stamp out more later, so it's not a big deal if I forget a layer or two. After the ink is dry, I color with Copics and start cutting out the layers. You can see I colored the spots on her dress, her arms, and then the different layers of the cake. For her arms, I left just a bit of extra cardstock (circled in red) to go underneath her dress. I generally don't like to have 2 cut edges fitting together (in this case the edge of the dress against the edge of the arm in that spot) so I'll put that bit of white underneath the dress, as if the arm is actually behind her body. BUT, that's just my personal preference; you could just cut right at the edge of the arm there. Next, since I'm using cardstock instead of foam tape for dimension, I stamped the image 3 more times on scrap cardstock and cut them out inside the lines so these layers won't show. I like using cardstock for dimension when foam tape would be too thick (until I find a thinner foam tape). Also, I like how the scrap layer really supports the upper layers all around, rather than just at the few spots where the tape is. <--Here you can see the scrap pieces are glued down to the blue patterned paper. There is just the slightest bit of room around the scrap layers. My next step (which I forgot to photograph) was to glue the arms with the cake to the dress piece. You may have noticed that I left the cake uncolored for this layer. Since I knew it would be covered up, I didn't bother wasting marker ink on it, but occasionally I will color even the underneath layers for a nicer finished look (if you leave the under layers uncolored, you can see the little white edges when you turn the finished card). It's way more obvious with thick foam layers, but not as much so with scrap CS layers. In this next picture, you can see I glued the body piece down. I also stamped just the cake portion 3 more times on scrap CS to pop up the cake. Again, I cut these pieces just inside the lines. Then I glued them onto the previous layer, and glued the yellow cake piece over top. For the very last layer (pink frosting), I again stamped the cake 3 times on scrap CS and cut inside the lines. This was kind of tricky since the frosting layers are so skinny. If I'm having a hard time cutting small pieces like this, I'll actually hold the pieces with a pair of tweezers while I'm cutting. After the last bits of scrap and frosting were glued down, I colored the little flames with Copics right on the blue paper. If it were darker, I may have had to cut out little white flames and glue them over to make sure the flames looked yellow. However, this blue was light enough that I felt I didn't need to do that. I then went over each flame with a yellow Spica glitter pen, and then over the pink frosting with a clear Spica glitter pen. And here's an angled shot so you can really see all the different layers. Whew! That was a long tutorial, but I hope it helps some of you with your paper piecing and/or paper tole. Thanks for visiting!! 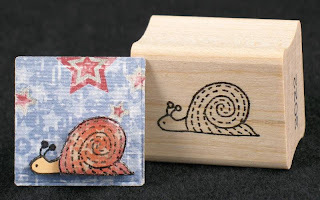 I've been trying to resist buying wood mounted stamps because they are more costly and take up a lot more space than unmounteds, but I finally broke down and bought some Karen Lockhart stamps recently from Ellen Hutson's store. I've been wanting to try an Inchie Challenge for a while and now I can! It's really hard to see all the detail so you might have to click to enlarge the pictures. 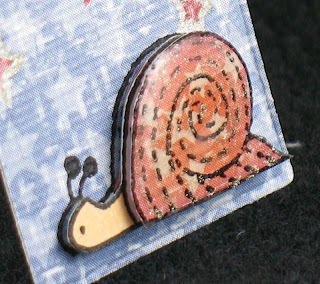 I used this adorable Itty Bitty Escargot stamp along with a couple different patterned papers from The Daisy Buckets' Rock Star line. I stamped him once on the blue paper, once on the red, and then 7 times on scrap white cardstock. I colored just his neck and head on 1 of the 7 and cut it out nicely. The other 6 were cut inside the lines to use for layering for dimension. 3 of them included the head, and then the other 3 were only of the shell. You can see the dimension better in the close-up. As usual, I'm using scrap cardstock for layering because my foam tape is way too thick to pop up such little objects. You can just barely see it, but I did one layer of dimensional adhesive on the shell, let it dry, then scribbled over the lines with a stardust glitter pen. I then put another layer of dimensional adhesive over that to lock in the glitter and give it more height. I also traced around the stars on the blue paper with the same glitter pen for more sparkle. I'm a little sad that my lack of photography skills don't do this little guy justice! I've had this idea floating around in my head for a while and tonight I finally executed it! I'm very happy that it pretty much came out how I imagined it! In case you don't get it, it's supposed to be a box of long-stemmed roses! 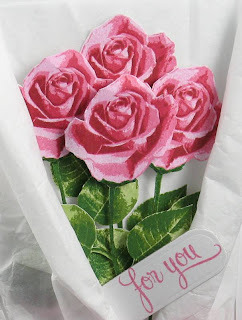 I know most people give bud roses, but I prefer the open roses so that's what I used. 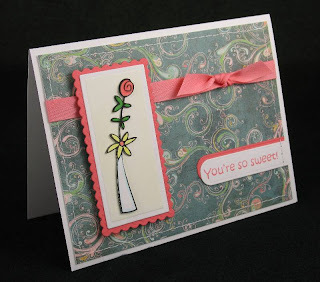 The roses and sentiment are all from the 3 Step Hearts & Roses set from Kitchen Sink Stamps. The design of the stamps is just brilliant!! They are so easy to layer perfectly and look so real! Not only are the flower heads done in 4 different ink colors, but the leaves are done in 3 so they are also very realistic looking. And I love that they're separate so I can place the leaves anywhere along the stem. Here's a close-up shot of the roses so you can see all the detail built into the images. 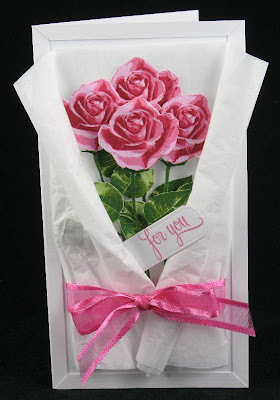 I stamped each rose with stem and leaves separately and then cut them all out before placing them in the "box." The top three are mounted with foam tape for dimension. I was originally planning on making more roses, but the "box" filled up really quickly and I stopped at 4. Just a note - the green colors didn't seem to really go together when I stamped them side by side, however they layered very nicely. I suggest if you're not sure about a color combo, try it out and it may work! I hope you like my idea!! Other materials used: white cardstock - Georgia Pacific; Nestabilities; ribbon - May Arts. Today's card is for yet another sketch challenge (I *so* love sketches!! ), this one at the Gina K. forum. Just like yesterday's card, I stayed really true to the sketch. I bought this Gina K. set, How Sweet It Is!, a while ago and this is my first time using it. I don't know why I waited so long - it's adorable! I love all the funky cute images and the sweet sayings! Also, I really love that $7 from the sale of each set is split between The American Diabetes Association and the Juvenile Diabetes Foundation. You have to check out the close-up shot to see that I actually cut out another vase with flowers in its entirety (yes, even the stem!!) and raised it up just a bit with a few layers of scrap cardstock for dimension. I also did some sewing around the entire layer of patterned paper. I just love the extra little touch the sewing adds, even if it's really subtle. You can also see that I left the Nestie in place while I airbrushed a really light yellow all over the base image. I didn't need to mask since I just covered up the whole thing with the extra vase and flowers. Other materials used: white cardstock - Georgia Pacific; Berry Sorbet cardstock, ribbon, and ink - Papertrey Ink; Graphite Black Brilliance ink - Tsukineko; Two Scoops patterned paper - Basic Grey; Copic markers and airbrush; Nestabilities. 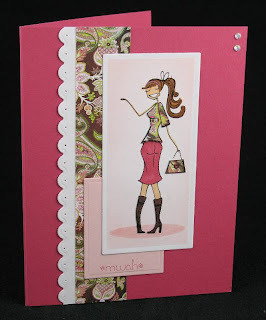 I played in another sketch challenge for today's card, this time in the Stamping Bella forum at Splicoast. If you look at the sketch, you can see I tried to stay really true to it - I only added the pierced scalloped strip to the left of the patterned paper and the 2 bitty rhinestones on the upper right of the card. Both of the stamps are from the Mwahbella with Words set. I did my usual paper piecing with a really cool piece of Basic Grey patterned paper from their Sultry line for her top and purse. I also used a plain brown piece of PP from the same line for her boots. The rest is colored with Copics and I added a little glitter pen to her headband and the heart on her purse. I masked off her feet and stamped with an oval from the clear ovals set from A Muse. I then cut the image out using a long rectangle Nestie and then left on the Nestie to airbrush the light pink background. The white scalloped strip was also done with a long rectangle Nestie. Other materials used: white cardstock - Georgia Pacific; Rose Red cardstock and ink - Stampin' Up!. I decided to play in a MFT sketch challenge, but I flipped the sketch on its side and turned it into a rectangle. 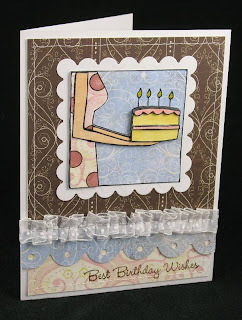 I'm still on my paper tole craze, but I didn't do too much with this card. I just popped up an extra glass so it looks as if the ice cream is really inside it, and then I cut the whole thing out and popped it up on 3 layers of scrap cardstock. I absolutely love how the cherry stem is just hanging off the top like a real cherry! For my cherry, I colored it red with a Copic marker, then covered it with red stickles, and then glued a red Dew Drop on top. Of course the whole thing is colored with Copics and I did a little bit of airbrushing on the small white rectangle so it wouldn't be so stark white. I have to admit that I am turning into quite a MFT fanatic!! Watch for more MFT cards in the future! 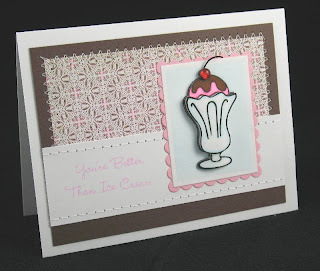 Other materials used: sentiment - Here's the Scoop set from MFT; white cardstock - Georgia Pacific; Graphite Black brilliance ink - Tsukineko; Pretty in Pink cardstock and ink, Chocolate Chip cardstock - Stampin' Up! ; patterned paper - Basic Grey; rectangle Nestabilities. 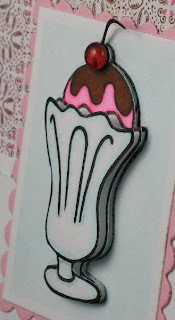 Today's card is made with a new set from My Favorite Things called Here's the Scoop. I had SO much fun playing with this set! One thing I really love about MFT is that a lot of their stamps work so well for paper piecing, which is my fave technique right now. For this card, I actually pieced just about every single bit of the focal image. I did the scene in a number of layers and papers. The bottom is the wall (Memory Box) and floor (Basic Grey). I did just a bit of shading under the chair line. The next layer is the whole chair (Basic Grey). 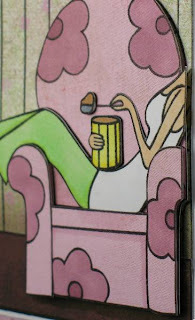 Then the whole thing was stamped on plain white cardstock and I colored the woman, ice cream container and spoon with Copics (except for her shirt). I actually cut the container apart from the woman so I could curve the container for a more realistic look. The topmost layer is just the bottom portion of the chair with a bit of shading with Copics. A little note: I didn't have just the right shape of Nestability to fit the image so I just cut the largest scalloped rectangle and overlapped the pieces just a bit to make it shorter. I then put the ribbon over it to cover the seam. I absolutely LOVE how this card came out and can't wait to send it to someone! Other materials used: sentiment - Here's the Scoop set from MFT; white cardstock - Georgia Pacific; Lavender Moon cardstock and ink - Papertrey Ink; Baubles from Stamping Bella; Copic markers; ribbon - unknown. I got the most *amazing* swap card in the mail today from Vanessa! The theme was "Things with Wings" and this angel is just so adorable! Please click on all the pix to enlarge so you can see all of the detail that she put into this work of art! The coloring is just gorgeous and it sparkles so beautifully in real life! You can see the glitter on her wings, and also on the spout of the watering can and all the hearts and buttons of her suspenders. And then you can see how the card opens up to reveal the full scene behind the angel. Hidden directly behind the angel is a mini envelope with a tiny card where Vanessa wrote me a note. 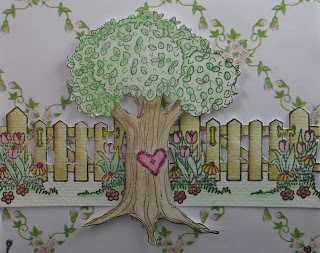 And here's a nice close shot of the scene so you can see how perfectly the whole tree is cut out and Vanessa even cut out the spaces in the picket fence!! I can't even begin to imagine how long all that precision cutting took! Also, there's more glitter on the heart on the tree and dotted on the flowers. This card is just gorgeous and I feel so honored to have it! Thanks so much Vanessa!! I'm very sorry to say that my swap card to you just went out Friday as I wasn't able to get to the post office sooner. It doesn't even begin to compare to this beauty, but I hope you like it anyway! 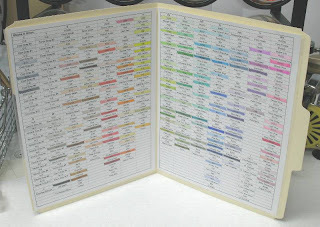 I showed the Copic Ciao color chart that I created as soon as I got my full set of Ciaos a few months ago. Well, since then I've started adding Sketches to my collection as well, so I decided I needed a new color chart. I just added to my old Ciao chart and reformated it to nicely fit on 2 pages. I taped 2 clear sheet protectors into a manila folder and slipped the sheets inside the page protectors to get the above. I wanted it inside the manila folder to keep the light off it so it has less chance of fading. I keep the folder right by my markers so I can pull it out anytime I want to choose colors. 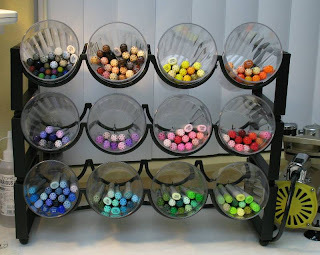 I also recently re-did how I store my markers. I hated having to put the markers back in the containers they came in everytime I used them, so I tried the Pampered Chef turnabout. That actually worked really well, but I outgrew it pretty fast! So I looked around and found some stackable wine racks at Pier One and cheap plastic cups from Walmart, and I've got a great storage system that I love and has plenty of space for more markers! And if I really want to, I can just keep adding more racks and cups to store even more! To secure the cups to the racks, I drilled 2 really small holes in the bottom of each cup and then wired the cups to the back of the rack (you can just barely see it when you enlarge the picture). I hope you like what I've come up with! Today I want to share a really quick and easy, but elegant card. 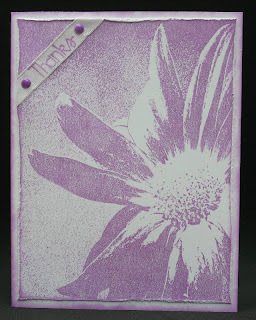 The Shady Daisy Backgrounder from Cornish Heritage Farms can be used entirely on its own to make the simplest card, or you can add sentiments and embellishments to make it even more gorgeous. I just distressed the edges of the main panel a bit and added some Stampin' Up! ribbon stamped with Thanks from Kim Hughes' Tag You're It set (also from CHF). I didn't have brads quite the right shade of purple, so I airbrushed them with a Copic marker. 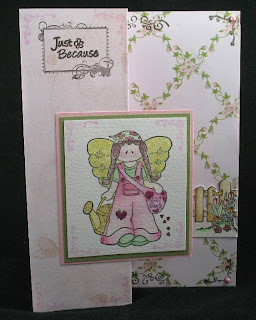 You should check out the CHF gallery to see all the other wonderful cards made with this backgrounder! I'm posting a little late because I knew I wanted a butterfly diecut, but the original one I chose was too big and just didn't work right. I played with it for a couple days before I remembered I had this old Quickutz butterfly and the size was just what I wanted. After I cut out the wings, I embossed them with a Cuttlebug embossing folder (meant for the Cuttlebug butterfly diecut), and then went over the raised portions with a clear Spica glitter pen. Then I glued down just the body portion and bent up the wings and antennae. You can see it a little better in the close-up picture where I tilted the card to the side. If you enlarge you can also see the glitter. I prefer the glitter pen when I want a more subtle glitter look, and I use Stickles when I really want a lot of sparkle. 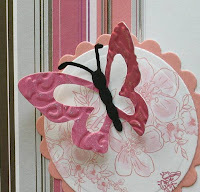 I glued the butterfly towards the top of the circle to look like it's flying off. I've seen a couple other people position their butterflies like this and I really love the look! Thanks for stopping by and another thanks to Amy - I really love this sketch!! Other materials used: white cardstock - Georgia Pacific; patterned papers - SEI Jolie Chocolat; sentiment & ink - Papertrey Ink (Simple Little Things set); brad - Pink Hedgehog Papercrafts; circle Nestabilities - Spellbinders. I popped up all the pink frosting parts on foam tape and there's a bit of yellow stickles on the candle for sparkle. I diecut the number 1 out of medium weight chipboard and also white cardstock and glued them together. 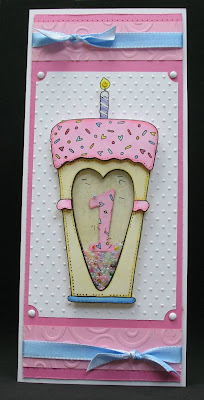 I then stamped it with the top frosting portion of the same birthday cake stamp and colored with Copics to match. A little added touch: If you look at the close-up shot, you can see I colored the edges of the craft foam layer with Copics so that it wouldn't be stark white. I totally CASE'd the design from a card by Anne Sanborn on p. 128 of the April 2008 issue of Cards magazine. The stamp was a little too tall for a standard 1/4 sheet card so I had to make it extra tall and the design by Anne was just perfect! When I was planning the card, I was going to change up more of the elements, but as I was creating, I just loved her card too much to change it! Thanks so much to Anne for this wonderful design!! 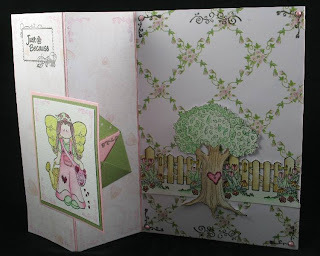 Other materials used: white cardstock - Georgia Pacific; pink cardstocks and paper piercing template - Stampin' Up! 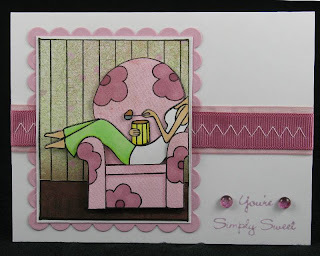 ; Swiss Dots and D'vine Swirl embossing folders - Cuttlebug; ribbon - May Arts; diecut - Sizzix; brads - Pink Hedgehog Papercrafts; shaker mixture - Darcie's.